View cart “Piya Ka Ghar” has been added to your cart. Amazing, retro Bollywood movie poster of the old Hindi film Honeymoon (1973) for sale. This is an actual surviving vintage Bollywood movie poster of the 1973 classic Hindi film, which featured Anil Dhawan and Leena Chandavarkar in lead roles. Printed and circulated a few years after the first release of the film (somewhere in the mid 1970s), this retro Bollywood movie poster was designed for publicity of the film but never ended up being used. This old handmade Bollywood movie poster features a large hippie styled flower etched out on the center, in which a black and white still photograph of a romantic scene from the film has been pasted into. The Devanagari Hindi typography on the top announces that the film is a comedy drama shot in the scenic locales of 'Rani Khet'. Honeymoon is a 1973 Bollywood comedy romance starring Leena Chandavarkar and Anil Dhawan in lead roles. Very collectible and rare, hand painted old Bollywood movie poster of the hit Hindi comedy film, Piya Ka Ghar (1972) for sale. This is an actual surviving old Bollywood movie poster of the 1972 comedy that featured Jaya Bhaduri Bachchan & Anil Dhawan in lead roles. Printed and circulated during the first release of the film (somewhere in the early 1970s), this vintage Bollywood film poster was originally designed for publicity of the film but never ended up being used. This poster was originally designed on a hand drawn canvas by one of the finest Bollywood movie poster artists/painters called Parchure, the owner of Pamart Design Studio in Mumbai. Bollywood movie poster artist Parchure’s original signature (in the name of his studio) is clearly seen on the bottom right of the poster. The poster displays a stunningly accurate solo portrait of Jaya Bhaduri wearing traditional Indian jewelry, which is typical of Bollywood poster designer Parchure’s mastery. Typography used in the poster is entirely in Devanagari Hindi. Piya Ka Ghar (My husband’s home) is a 1972 Bollywood comedy film starring Jaya Bhaduri & Anil Dhawan in lead roles. The film is an adaptation of Raja Thakur’s Marathi film Mumbaicha Javai. 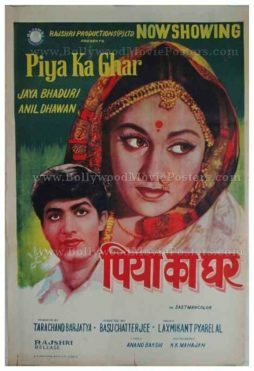 Vintage Bollywood poster of the hit Hindi comedy film, Piya Ka Ghar (1972) for sale. This is an actual surviving small sized, old Bollywood poster of the 1972 comedy that featured Jaya Bhaduri Bachchan & Anil Dhawan in lead roles. 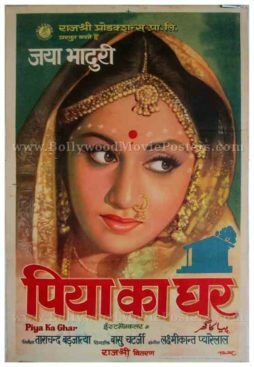 Printed and circulated during the first release of the film (somewhere in the early 1970s), this vintage Bollywood movie poster was originally designed for publicity of the film but never ended up being used. This is a very small sized publicity poster, measuring only 18.5″x11.5″ inches, making it incredibly rare and very collectible! The poster features an interesting collage of still photos of lead actors Jaya Bhaduri and Anil Dhawan at the bottom, whereas the remaining characters appear in a smaller still photos pasted inside a home shaped cut out at the center. Typography used in the poster is completely in English. 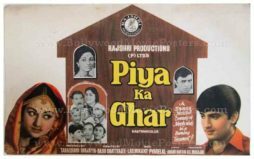 Beautiful handmade Bollywood poster of the hit Hindi comedy film, Piya Ka Ghar (1972) for sale. Printed and circulated a few years after the first release of the film (somewhere in the mid 1970s), this vintage Bollywood poster was originally designed for publicity of the film but never ended up being used. This poster was originally designed on a hand painted canvas by a small time art studio in Delhi, making it very collectible. The poster features a very accurate, large hand painted portrait of Jaya Bhaduri on the top, in a somewhat shy pose. The lead male actor, Anil Dhawan appears in a smaller portrait at the bottom. Typography used in the poster is a combination of Devanagari Hindi as well as English.